Last May, Eric Schmidt and I met to talk about The Walt Disney Company’s focus on technology. We started to explore innovative ways we could work together to bring one of the world’s most magical destinations to Google Earth’s millions of users… and how our guests could be a mouse-click away from visiting the place where dreams come true. 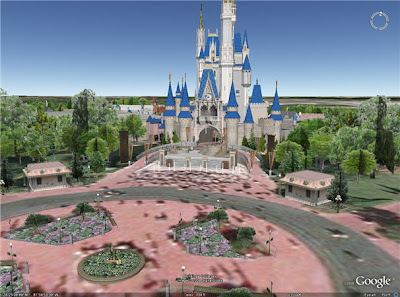 The result is Walt Disney World® Resort in 3D, an interactive, virtual Walt Disney World completely recreated on Google Earth. This revolutionary project features 3D models of our four Orlando theme parks and more than 20 of Disney’s Resort hotels. Incredible in scope -- containing over 1,500 3D models -- Walt Disney World Resort in 3D is the most detailed 3D rendering undertaken on Google Earth to date. From the summit of Space Mountain® to the watery confines of the Pirates of the Caribbean®, we invite you to explore the Walt Disney World Resort in Google Earth. It’s the next best thing to being there.